American-born Barbara Bonney is one of the world's most accomplished lyric sopranos. She now leads the field in her chosen repertory of roles by Mozart and Richard Strauss and is increasingly recognised as one of the finest Lieder and concert performers of her generation. 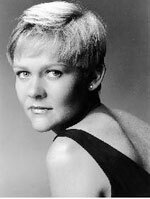 Barbara Bonney sings with the world's leading opera companies and her interpretations of Sophie in Der Rosenkavalier under Sir Georg Solti and Carlos Kleiber have both been released on video, as has her performance of the role of Pamina (Die Zauberflöte) from La Scala, Milan. She is also a regular guest with the Vienna State Opera, the Metropolitan Opera in New York, The Royal Opera House, Covent Garden, and in Munich, Hamburg and Geneva. In concert Miss Bonney has recently appeared with the Vienna Philharmonic under Seiji Ozawa and Riccardo Muti, the Berlin Philharmonic under Claudio Abbado (singing Mahler), Vladimir Ashkenazy and the Berlin Radio Symphony Orchestra (Mahler 2) and the Norddeutscher Rundfunk with John Eliot Gardiner (Paradies und die Peri and Mahler 4). In summer 1995 she took up a residency at the Tangleswood Festival in the USA.and performed extensively with Ozawa and the Boston Symphony Orchestra in addition to giving recitals and masterclasses. Other engagements include Falstaff and L'elisir d'amore at the Metropolitan Opera in New York, plus Figaro and Der Rosenevalier at the Bastille Opera in Paris. Barbara Bonney is also an prolific recording artist and her outstanding recordings to date have included many with Claudio Abbado, John Eliot Gardiner and Nikolaus Harnoncourt. Her release with Gardiner on Deutsche Grammophon (Lehár's Die lustige Witwe) has met with great critical acclaim as have her recital discs of Lieder by Richard Strauss, Mozart, Wolf, Mendelssohn and Schubert, all accompanied by the late Geoffrey Parsons. In addition there are complete recordings of Mozart's Le Nozze di Figaro, Don Giovanni and Die Zauberflöte with both Harnoncourt and Östman, and Humperdinck's Hänsel und Gretel under Jeffrey Tate.